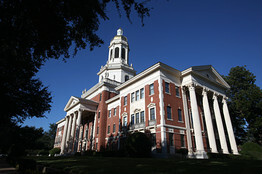 Those seeking admission to Baylor's Hankamer School of Business must submit the following materials: a completed application (online application preferred); two letters of recommendation from individuals who know you professionally and can assess your skills and potential; official undergraduate transcripts (international students who attended a no...Those seeking admission to Baylor's Hankamer School of Business must submit the following materials: a completed application (online application preferred); two letters of recommendation from individuals who know you professionally and can assess your skills and potential; official undergraduate transcripts (international students who attended a non-English-speaking school must provide professionally translated and interpreted academic records); a GMAT score report; a current resume; and personal essays detailing qualifications, experiences, and objectives in pursuing a Hankamer MBA. International students whose first language is not English must also submit a score report for the TOEFL or the IELS. Hankamer processes applications on a rolling basis; candidates are notified of their admission status as soon as a decision is made. "Baylor Business gives me a great chance to study in a small class size. I could learn and work as a team with my classmates who come from different background and various cultures. Moreover, students would be able to apply for graduate assistantships. This award also creates an opportunity for students to gain experience by working with professors." Baylor employs career placement professionals who work exclusively with the school’s approximately 90 MBA students as well as with alumni. Students tell us that “The career professionals are planning to take the case to businesses more aggressively than bring­ing the businesses to Baylor (although…some of that will [still] take place).” Students say this strategy makes sense considering that “Baylor is not competing right now with Texas, Rice, and SMU” when it comes to on-campus recruiting, in part due to the small size of the program. Some complain that “The [placement office’s] focus is on Texas, and if you’re not looking in Texas, good luck!” Employers who most frequently hire Baylor MBAs include: Accenture, American Express, Anadarko Petroleum, Bank of America, Baptist Health Center, Bearing Point, CITGO, CNA Insurance, Comerica, Community Bank And Trust, ConocoPhillips, Deloitte & Touche, Echostar Communications, Edward Jones, Ernst & Young, ExxonMobil, FBI, First City Financial, First Preference Mortgage, Hatteras Yachts, H.E.B. Grocery Company, Intecap, Internal Revenue Service, Johnson & Johnson, JP Morgan Chase Bank, Keller Williams, Kersher Trading, KPMG, Merck, Microsoft, Middleton, Burns & Davis, Occidental Services, Inc., Perot Systems, Perryman Consulting, PricewaterhouseCoopers, Protiviti, Quala-T, Steak ‘n Shake Operations, Inc., Sterling Bank, Sungard Consulting, TXU, Texas Farm Bureau, U.S. Department of Labor, UBS Financial Services, Inc., and Wal-Mart. Where you choose to attain your MBA is an important decision. Baylor University can be a valuable partner on your journey in achieving your highest personal and professional potential. Baylor offers MBA students the exceptional resources of a premier institution recognized worldwide for academic quality, superior teaching, and a reputation for graduating persons of both competence and character. Small classes, hosted at the university’s state-of-the-art Hankamer School of Business in Waco, Texas, set the stage for an integrated learning experience that balances leading-edge business theory with practical, hands-on, real-world challenges. Semester 2 - Discover ideas and technologies that lead to a company's competitive advantage. Every day you will be challenged to think deeper, consider a greater range of perspectives, debate alternatives and seek solutionsÂ—discovering how companyÂ’s operate, improve and sometimes fail. In the six module courses, you will focus on innovation and change and how companies differentiate themselves in the marketplace. During a semester-long core course, you will discover how the management of a companyÂ’s most valued resource Â– people Â– impacts the success or failure of a company. Lockstep 2 would be taken in the first year of the curriculum if a student does not take IMS. Semester 3 Â– Deliver results for the company. How does a company evaluate its performance? Did it achieve its objectives? The six module courses describe metrics, financial statements, strategic market planning, market structure and corporate governance. Furthermore, your elective courses provide the opportunity for you to expand these ideas in more detail. In your final Focus Firm class, you will serve in a leadership position to deliver a comprehensive, fully-integrative analysis of the companyÂ’s project to firm executives. Some students begin the MBA program by taking the Integrated Management Seminar (IMS) if they do not have a business undergraduate degree. This semester is waived for students with a business undergraduate degree. Semester 1 - Define the purpose of business. Who are the stakeholders? How do firms manage in todayÂ’s dynamic environment? During the six module courses, you will explore the goal of the firm and fundamental business concepts as defined by the basic principles of cost accounting, strategy, managerial economics, customer focus, decision making with risk, and corporate finance. In conjunction with the module courses, you take semester-long core courses where you learn the impact of technology on organizations, the strategic view of operations management, and how to communicate effectively. Want more info about Baylor University, Hankamer School of Business Full Time MBA? Get free advice from education experts and Noodle community members.